Welcome to the David Winter Cottages news page. This web page is designed to bring to you as much as it is possible up to date and accurate information with regards to the world of David Winter Cottages. The latest updates are either marked or are in pink. After what will have been 6 enjoyable years, David Winter and Enesco have agreed that the David Winter Cottage range from Enesco will no longer be produced from the end of December 2002. 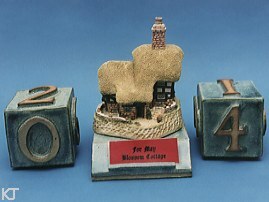 During 22 years David Winter Cottages have been one of the most successful collectible lines that our industry has seen. With that in mind it is intended that 2002 will be a truly memorable year for David, his collectors and retailers. There will be a full schedule of new releases, retail promotions and the 'last ever' David Winter/Enesco cottage. David intends to be in the USA in the autumn and we are currently finalising our UK plans, details of both will follow shortly. David has, through David Winter Cottages, gained many enduring friendships around the world, both with his collectors and dealers. He is anxious to maintain this friendship. He thanks all who have either helped or been associated with him for giving him 22 wonderful years. He has derived enormous pleasure from producing David Winter Cottages and from sharing his enjoyment with so many others. David may also explore other avenues in the future as he is keen to maintain the name of 'David Winter Cottages', and it is possible that there may be some products developed in the future, all be it on a much-reduced scale. Enesco will be writing to the members of the David Winter Guild very soon with details of all arrangements for 2002. Although everyone at Enesco will miss the involvement with David in the future, we are all committed to ensuring that this year is a great success. We hope that collectors, dealers and all who have a love for David Winter Cottages will join us in making 2002 the best year ever. On a personal note I am not surprised this has happened as I have observed a steady decline over the years with less and less shops stocking David's pieces (My closest is over 20 miles away!). I feel that if there is nobody in a large city like the one I live in selling them then the range was doomed to falter eventually. It will though be interesting to see what David does next! Rest assured this web site will still continue.